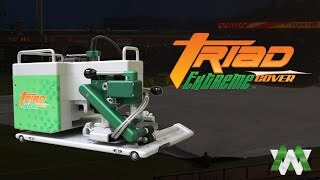 The Triad Extreme Shelter is a small but powerful welding machine for the tent and shelter industry. 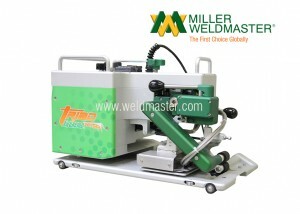 The machine is portable and designed to move along a tabletop track, or as a stationary welder. The Extreme Shelter creates strong seams for your production every time. 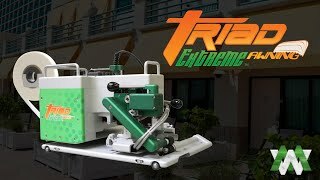 What can the Triad Extreme Shelter make? All of Miller Weldmaster’s welding machines are able to create strong seams in several applications. 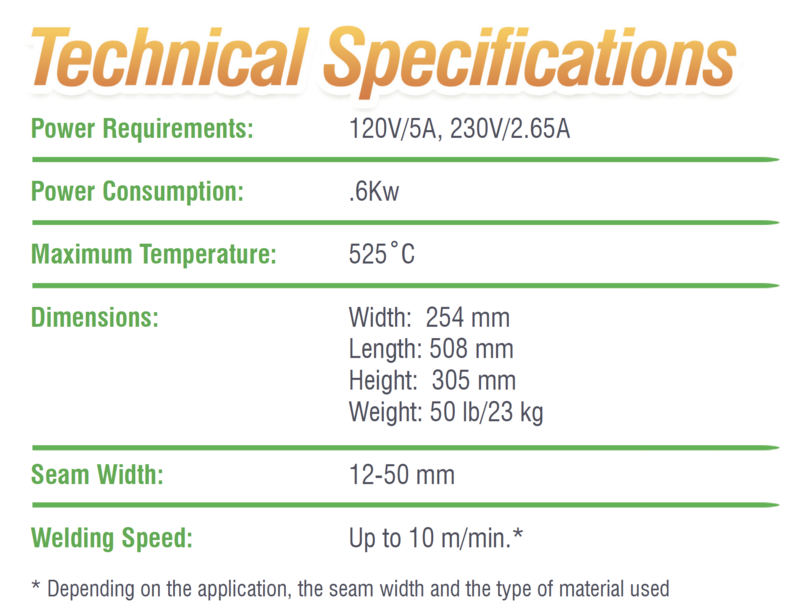 The Triad Extreme Shelter is specifically designed to be beneficial for the shelter and tent welding industries. 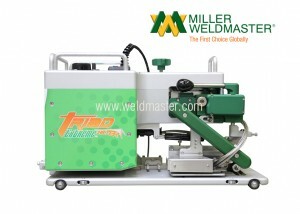 The machine can weld PVC, PE, and PP among other materials. 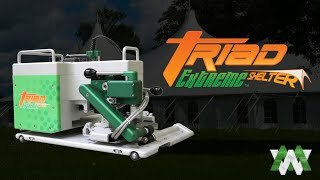 The Triad Extreme Shelter in particular is useful for smaller production workshops, as the machine is portable and designed to be small and efficient. It is also a quiet machine, a feature your production employees will be grateful for. If your production floor does not have a lot of space to work with, a tabletop configuration of the Triad Extreme Shelter will still give you the results you need at a lower space cost. If you do tent welding or construct other shelters with industrial fabric, you know that you need a machine that can produce tight, smooth seams. On the one hand, you need strong seams to create a water-tight structure, and on the other hand, your product likely is assembled and disassembled daily. Creating a strong weld is crucial, and the Triad Extreme Shelter is designed to do just that. 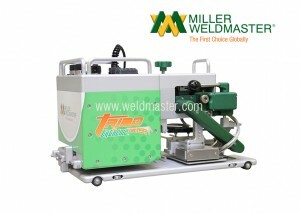 This machine has the same wedge welding power as some of the other Miller Weldmaster tent welding machines, but is a smaller, portable option for a production that needs versatility. These videos will show your firsthand how the Triad Extreme Shelter is efficient and easy to use. Miller Weldmaster provides ample training for your employees to help them get the most out of this machine, but for the most part it can run itself. The controls and design are simple to understand, and the machine uses Miller Weldmaster’s patented self-centering technology. You’ll get a consistent and strong seam every time with the Triad Extreme Shelter. Customers worldwide are becoming more efficient in producing everyday products seamlessly. With noiseless operation and the same patented wedge placement capabilities of the Triad Cover, Awning and Universal; The Triad Shelter can produce tents and other shelter material at a faster pace than ever before. You want your production line to move as smoothly and efficiently as possible, with a consistent product created every time. Machines from Miller Weldmaster are guaranteed for consistency, and are designed with a self-centering wedge to ensure accurate wedge placement every time the machine is in use. This small, but important, feature eliminates welds that are placed incorrectly and saves you time and energy, as you don’t have to correct mistakes. 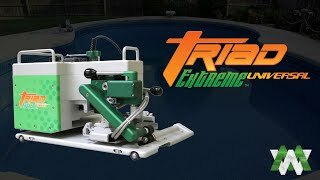 The Triad Extreme can be configured with track to accommodate any length of travel. 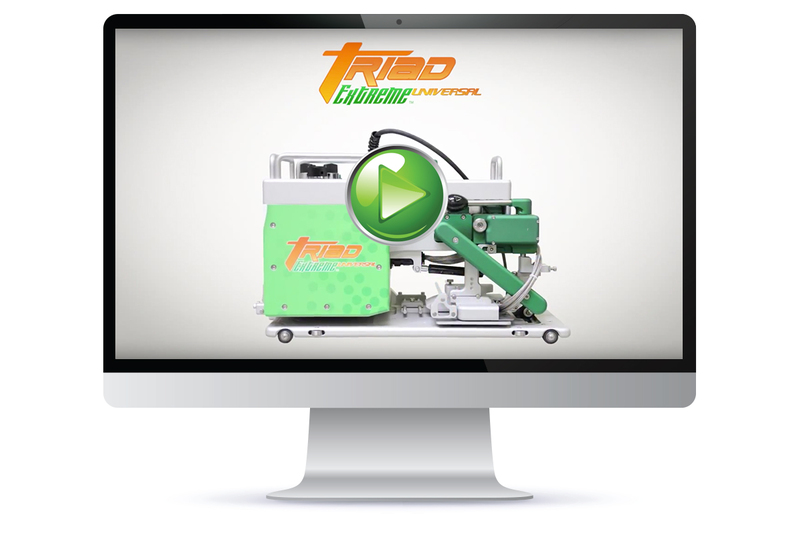 Track is available in 5′ sections and allows the Triad Extreme to be self propelled finishing your seams with minimal material handling. 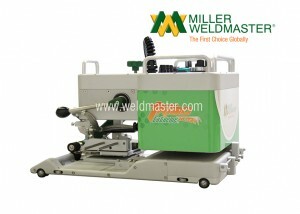 Miller Weldmaster has really helped in the development of our business. The service has been excellent, replacement parts arrive fast, and there is always someone to help with repairs on the phone.